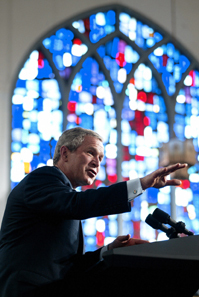 Is President Bush too vocal about his faith? Religion has always influenced American politics. But some analysts contend that President Bush's frequent use of religious language crosses the line separating church and state, alienating voters who don't share his beliefs. Critics also charge that Bush is using religion to appeal to conservative Christian congregations and has inappropriately asked them to campaign on his behalf. But others say references to God and the Bible are appropriate, especially in difficult times, and that the president has every right to approach churchgoers for votes. Meanwhile, recent polls show a “religion gap” between regular churchgoers, who overwhelmingly favor the GOP, and secular voters, who generally favor Democrats. Democratic strategists maintain they can still attract religious voters, but Republicans say the party is too liberal on social issues like abortion and gay marriage to appeal to many religious conservatives.